In 1895, a Baltimore, Maryland engraver was producing printing plates for the Baltimore Chewing Gum Company. Realizing the business of chewing gum was doing poorly, August Goetze (pronounced gets), offered to buy the business for his son, William. Over the years the company produced standard confections. William’s son, R. Melvin, joined the company in 1909, shortly before the start of World War I. Despite shortages of sugar and chicle, the business continued, but the war inspired the family to develop new confections. In 1917, Melvin developed “chuees” in the family’s kitchen. These became known as Caramel Creams and were released to the public in 1918. 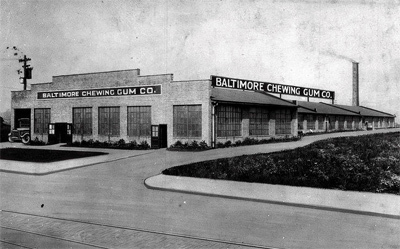 The candies performed well in the marketplace and the company saw consistent growth, requiring a move to a 24,000 square foot plant in downtown Baltimore. By 1928 the company had tripled its production. In the mid- to late-1930s, the three generations of men opted to focus on Caramel Creams as a primary product. Melvin’s son, Melvin Jr., joined the company in 1935. During the 1940s they worked at perfecting the confections and saw great success. In 1951 they changed the company name to Goetze’s Candy. Melvin Jr.’s sons, Randle and Spaulding, joined the company in 1959 and 1965, respectively. During this time they worked at automating production and expanding distribution. Soon Goetze’s would become a nationally-known name and the company would break into the international market. (Spaulding’s two sons would join the company in the early 1990s). 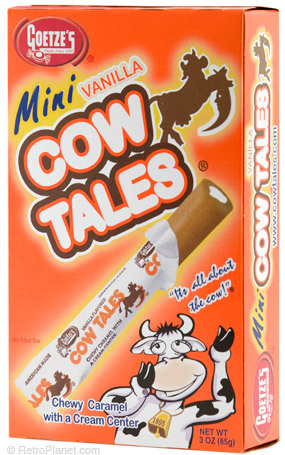 Mini Cow Tales were introduced in 1987. Caramel Creams, also referred to as “Bull’s Eyes”, have been the company’s signature product since the 1940s. These individually wrapped candies contain a soft caramel with a vanilla cream center. Throughout the years other flavors were introduced, including strawberry (1980), peanut butter (1975), chocolate (1971) and licorice (1964). But the old-fashioned Bull’s Eyes sell the best. Cow Tales are simply an enlongated version of the Caramel Cream. A fifth-generation family-owned company, Goetze’s continues to produce all of its confections in downtown Baltimore. Goetze’s attempts to source ingredients and materials locally (in Maryland) whenever possible, and continue to carry 100% US-made product line. Since 1895 the company has never changed hands and the factory’s location hasn’t changed since 1928. This makes Goetze’s a truly retro brand and its candies tasting just like they did in the good ‘ole days. Did you eat Caramel Creams or Cow Tales as a kid? Have you ever tried the other flavors over the years? Which one was your favorite?